Through the TRWP Connect MOOC (#trwpconnect), our SEED partnership was able to explore the concepts and practices of “making” in the classroom, model and interrogate the role of writing in the making process, adopt a writing-as-making approach to crafting of texts, and build an understanding of how Connected Learning could enrich teachers’ work with writing in the Common Core and Essential standards across the curriculum. The structure of #trwpconnect was new to most of the participants, and the practice of using digital technologies as participatory platforms where writing played a central role in community-building was a significant departure from the kinds of professional development EB Aycock teachers were accustomed to. Many participants were unsure what to expect from a connectivist MOOC and were surprised to learn that they would not be moving through content delivery modules and completing quizzes to assess their mastery at the end. Instead, the MOOC would become both an exercise in and a study of Connected Learning and the habits of mind and body (new literacies) that are necessary for collaborative writing, learning, and participation in academic and civic spaces. 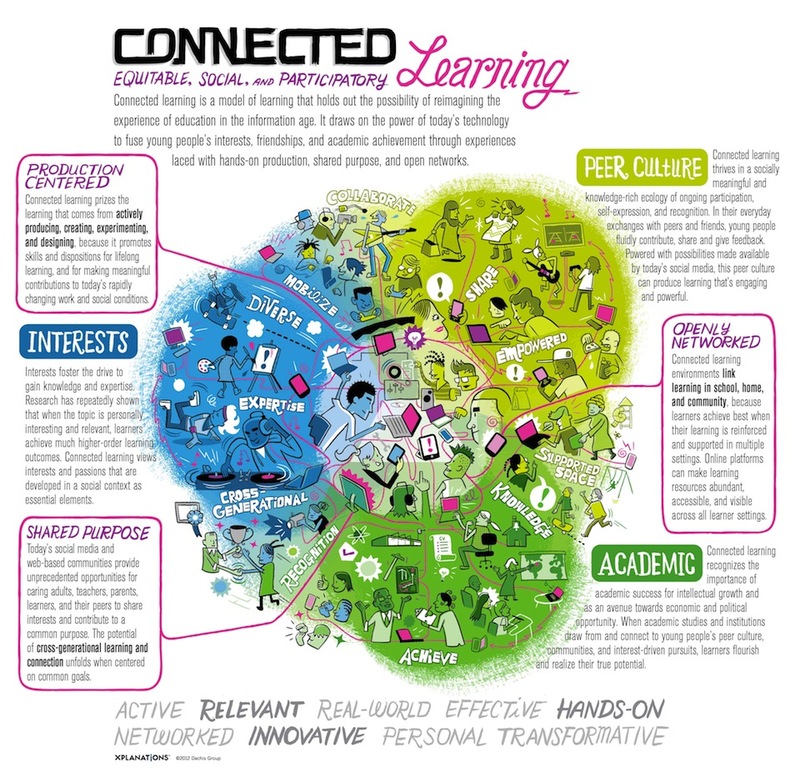 As a remix of NWP’s Making Learning Connected #clmooc, #trwpconnect was divided into six make cycles that engaged participants in networked disciplinary and interdisciplinary making and writing. Participants explored physical, digital, textual, and object-oriented making projects, working together to craft reflective self-focused user guides, to make paper circuitry projects, to produce conceptual and spatial maps, to create graphic stories, and to design connected learning plans for their own schools and classrooms. Guided by the mantra of “make, share, connect, reflect, and repeat,” we considered the role of writing in developing craft, technical, and disciplinary literacies as well as the role of writing in creating and maintaining these shared-interest communities, both in and outside of school. We explored the multimodal and multi-mediated nature of writing across the curriculum, and we experimented with new media for participating in and creating context-dependent texts. In the last make cycle, participants were asked to create a Connected Learning plan for themselves or their classrooms that would integrate production-centered writing and making and to document that process. Participants then reconvened in June 2014 to reflect on those plans and their implementation and to document that work by creating practice-focused resources for Digital Is. The resources collected here trace the direct impact of our SEED partnership, and from this work we can see the various ways that teachers are wrestling with, integrating, and embodying Connected Learning in their own complex contexts. From designing new units and activities that engage students in producing multimodal texts for digital networks to considering how Connected Learning might break down communication barriers between students, teachers, schools, families, and communities, these resources demonstrate the impact of the #TRWP Connect MOOC, showing that Connected Learning is an adaptable and flexible framework that can inform the ways we consider and teach writing, making, connecting, learning, and participating in a text-heavy, digital world. Genius in your own "write"